This double live disc really shows why Judas Priest made a big mistake in not taking Rob Halford back. The album rocks out much better, and captures the Priest magic much closer than his old band's most recent live album. Perhaps the spirit of JP lives on in this group more so than in the band being called "Judas Priest." This CD set includes a lot of old Priest gems (including "Stained Class" and "Tyrant"), quite a few tracks from the Halford album, and three studio pieces. The studio cuts range from pretty standard hard rock/metal to a killer balladic piece. The live cuts, for the most part, are performed quite faithfully. When changes are made to the arrangements, they really are interesting and seem to be improvements. 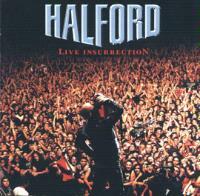 Halford starts this live album as his studio one did, screaming out. This rendition of this modern metal classic smokes. Another killer cut from Halford's studio release, this one comes across quite well here. This is another strong rendition. This time it is of one of the better cuts from Halford's Fight days. The guitar solo section here takes on a rather Priestish mode. This is a staccato sort of metal cut that really rocks out in its performance. Halford's vocal performance is exceptionally strong here. This one was not really live, but rather done on a sound check. Honestly, though, it they hadn't told you in the liner notes, you never would have known. The cut is a pretty standard metal number. I still can't believe they did this number and smoked it at that. A more obscure, but one of the best, Priest cuts, you can almost close your eyes and picture KK and Glenn Tipton on this. That is how faithfully this group does the piece. Another Priest cut, this is a faithful rendition of a piece that is a bit generic. Another surprising choice of cuts, this one is another favorite from Priest. The group, as usual, smokes on this one. This one is a little slower and more melodic piece from Halford's solo album. Performed in duet with Iron Maiden's Bruce Dickinson, this one should appeal to metal fans everywhere. Another cut that was not part of the show, but rather some serious studio magic, this is one of the considerably strong tracks from the solo CD and it really rocks. This is another smoker with some great textures. "Sad Wings" is yet another flawless performance of a smoking hard Halford cut. A bit slower, this cut is a bit on the generic side. One of the strongest and most dramatic cuts from the studio release, this one is exceptionally emotional and poignant in this performance. Musically this one feels a lot like Iron Maiden and really smokes, however, the lyrics are rather trite. The classic Priest instrumental intro piece, this one is flawless and really benefits from the audience chanting to it. Screaming out, this is another Priest classic delivered in fine fashion here. This is a pretty faithful rendition of this Priest standard. Another cut from the "I can believe they did this one" files, this is definitely a highlight of the album. The performance is a bit different from the original, but certainly rocks. Always a vocal showcase, this one is a bit different take on the classic old Priest number, but it is an incredible song. Another pleasant surprise in its inclusion, this is another Priest smoker delivered in fine fashion. The first of three new studio numbers, this one is a fast paced, modern sounding heavy metal cut. This new number sounds a lot like a cross between Judas Priest and Iron Maiden. This is a very powerful love gone away ballad that really works well. It is one of the strongest cuts on the album and a great way to end the disc.